I was talking with a good friend the other day about a knee complaint her 12-year-old son was having after starting to run Cross Country for the first time. She said, “I need help.” Her son was already very athletic, playing competitive travel baseball, as well as middle school baseball. He did plyometric training three times per week as well and did moderate (low weight) strength training in the gym. Basically, he was very fit and in shape. So he was asking, “Why me?” Why was he having pain? Of course, pounding the pavement is hard on even the youngest, best, knees but it seemed like there must be something else at play as well. I didn’t quite understand why a young athlete, in this top physical condition, would be having such discomfort so early into this new activity. I started digging into his medical history to see if I could find a way to help him. Throughout the course of conversation, we found the key. My friend happened to mention that her son had been diagnosed with the mildest form of Ehlers-Danlos Syndrome (Class III) when he was 9. 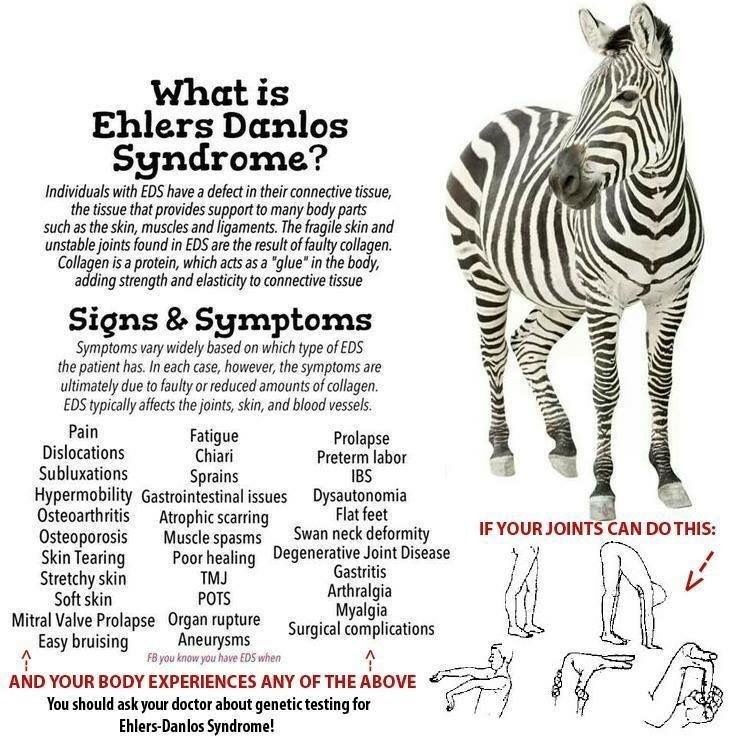 Ehlers-Danlos is made up of a group of syndromes of varying degrees but all generally classified as collagen-deficient connective tissue disorders at some level. The manifestations of Ehlers-Danlos are easy bruising, joint hypermobility (loose joints), skin that stretches easily (skin hyperelasticity or laxity), and weakness of tissues. Even though my friend’s son was very fit already, it was likely the manifestations of even his mild form of Ehler’s-Danlos that were creating his knee pain symptoms! Once we had put this connection together, I immediately went to work on a plan using my knowledge of nutraceuticals and body dynamics. We came up with 3 simple things (plus one he was already doing and we just needed to reinforce it) to help overcome this knee pain. Everyone with this disease – or any kind of joint/muscle pain – should be on baxyl which is far superior to glucosamine-condroitin-msm complex. Everyone should also take a multi-vitamin/multi-mineral with Hyaluronic acid, vitamin E, Co-Q10,Conjugated Linoleic Acid (CLA), Omega fatty acid complex, and Flax Seed with Lignan. These all address the life support of your collagen with the added benefit of keeping your arterial walls pliable and reducing the chances of arterial sclerosis by assisting in the proper breakdown of plaque and cholesterol. This recipe has a fruity/nutty flavor with the consistency of a smoothie. It has a multi-dimensional benefit in that it can be used as a meal replacement to help you lose body fat, build collagen, and emulsify the fat; thus, keep the arteries clean and clear. And it is good for your heart as well as your respiratory system! Be thankful and realize that while you – or someone you love – is dealing with a very real physical disease, mental state is crucial in living with – and triumphing over – it. Luckily, my friend’s son already had this part down. He understood the power of the mind and could tick off in a second, several reasons why he was actually thankful he had this disease. This was more than the power of positive thinking, he developed a full personal development plan and then executed it with commitment and dedication. I attribute that a lot to his mom who was consistently showing him how the disease actually made him better at the things he did. For example, he was a starting first baseman on both middle school and competitive travel ball teams. The extreme flexibility caused by his Ehlers-Danlos meant he had the immense ability to stretch into complete splits – in every direction – to make the play. As a result, he had become known as the “best first baseman in his age group” in a tri-county area. The message behind all this is that when you – or your loved is faced with a “life-altering” illness or disease, remember that attitude is a huge part of dealing with it. Everything in life isperfect and is happening for a reason to serve you in your life in some way. If you spend a little time/effort seeking how you (or they) are being served – in a positive manner – by this “seemingly-negative” situation, you will find you are able to triumph over it with less effort. Add a little good, old-fashioned, effort in the form of taking care of the physical manifestation of your body – right along with your spirit – and you can learn to say “Thank You God” for anything! For the past two decades, Lisa Christiansen has served as advisor to heads of state, peak performers in sports, business, politics and entertainment, as well as leaders around the globe. Lisa Christiansen is the global authority on Leadership Psychology; a recognized authority on the psychology of leadership and human behavior, with a Doctorate in Exercise and Nutritional Sciences and a degree in psychology. Dr. Lisa Christiansen has helped millions of people create extraordinary lives globally. Her expertise and guidance has enriched the lives of icons such as pop superstar Kelly Clarkson, Olympian Dara Torres, and superstar Patrick Dempsey. Posted on March 14, 2016, in Uncategorized and tagged Actress: Can’t Buy Me Love. A life coach, and personal empowerment expert, business consultant, Dr. Lisa Christiansen, health and wellness, Life Coach, Lisa Christiansen, Lisa Christine Christiansen, motivational speaker, self empowerment, success coach. Bookmark the permalink. 1 Comment. A lot of people in the wider eds community are upset by this article. EdS is a wide spectrum and whilst eds 3 (hypermobility) is considered milder than some otheer forms people experoence it on different levels. I have daiily dislocations and have to get a mobility scooter at twenty years old. Another woman had to haave her jaw wired shut because of it. We can have heart defects plus. Soo many comorbities and to see it referred to as mild is quite upsetting and undermines those who really do suffer a lot every day. Id also like to let you know that eds sufferers have defective collagen and arent actually deficient so there is no magic cure and whilst that concoction may help him feel better in himself it wont actually affect the eds at all. Id be happy to provide sources and invite you to our group whhich is full of people full of lots of useful information if youd like to learn more.